Thomas Lancaster has written 149 articles so far, you can find them below. I recently joined Robert Clarke in speaking about contract cheating to a room full of academics and people from within the wider Computing industry. As well as looking at examples of contract cheating and the research involved, the talk also considered some of the implications for student employability. The presentation took place for the Wolverhampton branch of the British Computer Society. The slides, hosted on SlideShare account for Thomas Lancaster, are included here. Contractor sites, such as Freelancer.com, are widely used within the Computing industry, both by workers and contractors. It is only when they are used for academic work which is then submitted towards academic qualifications that this becomes unacceptable. It was interesting to hear the reactions of the wider Computing sector to the research. That is certainly an area for further research, discussion and exploration. The educational arena has been changing with the increased availability of courses offered through MOOCS, Massive Open Online Courses. I proposed some general information about the advantages of MOOCs, as part of an article on the Birmingham City University School of Computing, Telecommunications and Networks blog. But these large scale courses, usually delivered around the world for free, are well worth current Computing students taking on top of their normal studies. Here are five reasons why this is the case. According to the Times Higher Education, the typical British MOOC costs £30,000 to develop and deliver. That’s a substantial amount of money being invested to provide high quality materials. Showing additional skills on a CV are always worthwhile, particularly when these are not skills already covered on the course. This shows an interest in learning beyond the academic qualification and a willingness to develop new skills. Regarding of how well any academic module is delivered, there will always be people who will benefit from alternative presentations of the material and different examples. Having access to these further videos and learning materials is useful. Term time at university can be intensive, with many new subjects to study. By scheduling in preparation during the vacation periods, and using the MOOC provided materials, this can help to ensure a better understanding, and subsequently higher marks in the official university modules. A good MOOC is structured to work successfully for online learning with large numbers of participants from the outset. Kevin Werbach relayed his experiences of what it takes to develop a successful MOOC. These are more than just recordings of lectures, more carefully crafted content along with activities and a largely supportive community. This helps the self-selecting MOOC learners to be successful. All the evidence points to MOOCs being valuable and being set to have a big impact on the way that education is delivered. Sure, they can’t completely replace a taught caught, with the structured learning environment and valued qualification, but they can add to the overall experience. I recommend that students explore MOOCs to see how they can add value to what they are studying. 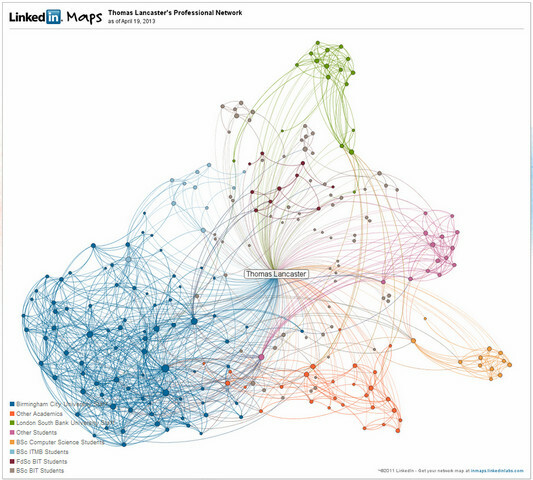 Just ran through the LinkedIn Labs InMap Tool to see what my professional network looks like. Unsurprisingly, it’s dominated by my current place of work, but it’s certainly interesting to see the different links between the people I know from different aspects of my career. In particular, there’s a group of other academics not directly connected through any of my workplaces, but all of whom seem to know one another. That just demonstrates the value of contacts made through groups such as the Higher Education Academy. At the 2013 HEA STEM Conference, we held an introductory meeting for the Special Interest Group in contract cheating. Although the group is primarily aimed at the Computing discipline, the group is not discipline specific and should be of interest to all areas. A short presentation was held to kick off the session and the slides (hosted on SlideShare account for Thomas Lancaster) are included here. One thing that I did for the slides was that I chose a live example of contract cheating (a request for an Information Systems student project found at Freelancer.com). Unfortunately, no-one was able to attribute this during the session, so this remains in the slides as an activity for anyone interest. We also briefly shared some new success at using TurnItIn to find details of assignments, thanks to students starting to include their assignment specification along with the work they uploaded for marking. The session finished with delegates discussing some of the good practice they use to prevent contract cheating. This included staff who were able to get to know their students and question them on anything amiss, as well as various staged submission types. However, methods to circumvent these checks were also shared. As always, there was a sense of surprise around the room that this type of cheating was happening, meaning that continued discussion about contract cheating is needed. The mailing list for the HEA Contract Cheating Special Interest Group can be joined here. As part of a wider research project looking into Computing placements and employability, Nzinga Deenah and I conducted an investigation looking at the availability of resources online to support placement students across the sector. The argument was that by advertising these resources online, Higher Education Institutions were helping to promote and market their courses and the opportunities that they provide to their students. The slides can be accessed in my SlideShare account (Thomas Lancaster on SlideShare), but I’ve also embedded them here for ease of reference. One observation we did make is that many placement resources end up being private. It would be good to see increased sharing and reuse across the sector and that is something which we can all work towards.